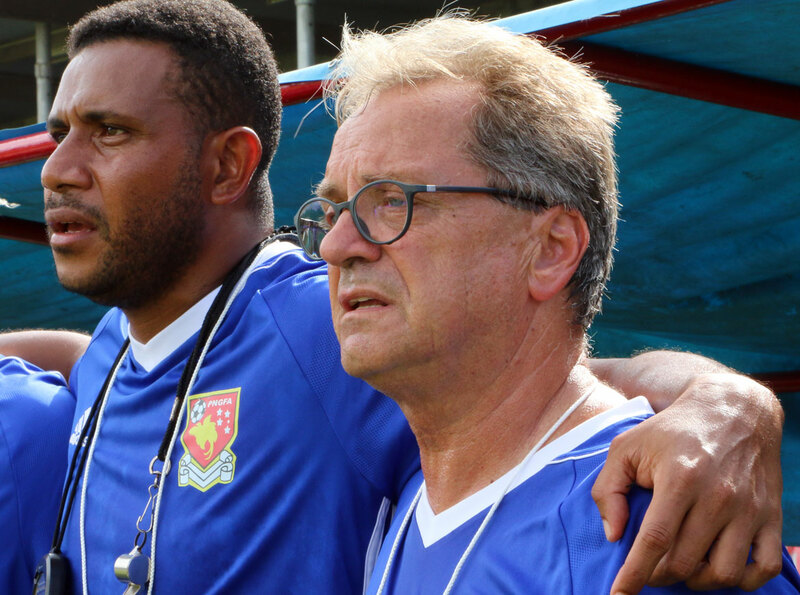 Papua New Guinea coach Flemming Serritslev (R) with assistant coach Reggie Davani. What looms ahead for Papua New Guinea and the Solomon Islands tomorrow at PNG Football Stadium couldn’t be more different in the eyes of Papua New Guinea coach Flemming Serritslev. “The starting points for the two teams couldn’t be more different than the case is,” Serritslev said during the pre-match press conference on Monday. Serritslev knows that the odds are against his side. “In the first instance I think people would say that we’re on a mission impossible. Serritslev knows that in this game, nothing is impossible. “I would use just one example from the European Champions League where Paris Saint Germain won 4-0 at home against Barcelona,” he explained. It’s the kind of tale that helps him inspire his players to pull of one of their biggest challenges yet. “If we didn’t believe that we could do it, then it wouldn’t be necessary to line up tomorrow. Serritslev said it’s something the side has done before, pointing out the need to score five goals against Samoa to progress to the OFC Nations Cup semi-finals. “Of course the Solomon Islands is a much different opponent, much stronger. After the loss on Friday in Honiara, the Dane believed the biggest barrier to victory in Port Moresby would be the attitude in camp. But he’s been impressed with how the players have bounced back. Papua New Guinea will play Solomon Islands at PNG Football Stadium in Port Moresby on Tuesday 13 June in the final Group B match of the 2018 FIFA World Cup Russia™ – OFC Stage 3.